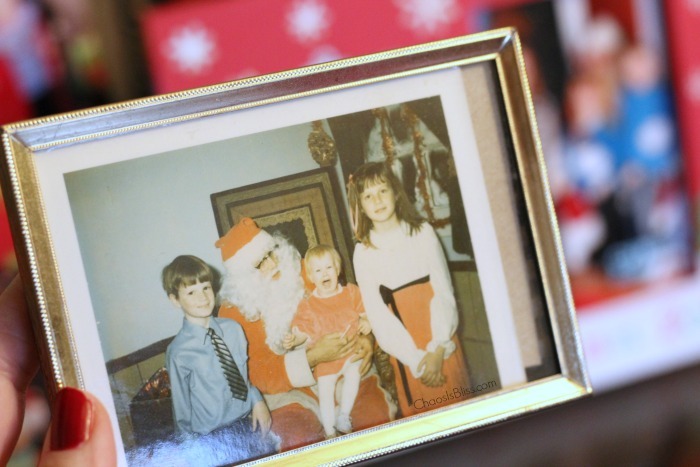 One of my favorite Christmas cookies that my mom made when I was growing up are Nutmeg Logs. They are almost a shortbread cookie base, with a layer of stiff icing on top and the slightest hint of nutmeg. They’re buttery and light, and the perfect cookie to have with coffee or milk! When holidays roll around we always find excuses to overindulge. But as I learned on one of my grocery tours with a registered dietitian this summer, you don’t have to sacrifice flavor when you’re making small changes, such as switching to a lighter cream cheese. The theme from nutrition experts seems to be moderation. If you have a favorite Christmas cookie, make it as you like – butter and all – but limit your serving size. When you’re baking your own cookies, you have ultimate control over how large or small you make your cookies. Similar to the theory of a smaller plate for smaller serving size, trick yourself by making your cookies slightly smaller – just don’t use that as your excuse to have three or four more! I had such good luck using Kroger Cream Cheese & Greek Yogurt in my Skinny Pumpkin Dip recipe that I’m incorporating it into my mom’s icing recipe for these cookies. Preheat oven to 350°. In a mixer, cream butter with vanilla and almond flavorings. Gradually beat in sugar, then blend in egg. In a separate bowl, mix together flour, nutmeg and salt. Add to butter mixture and blend well. 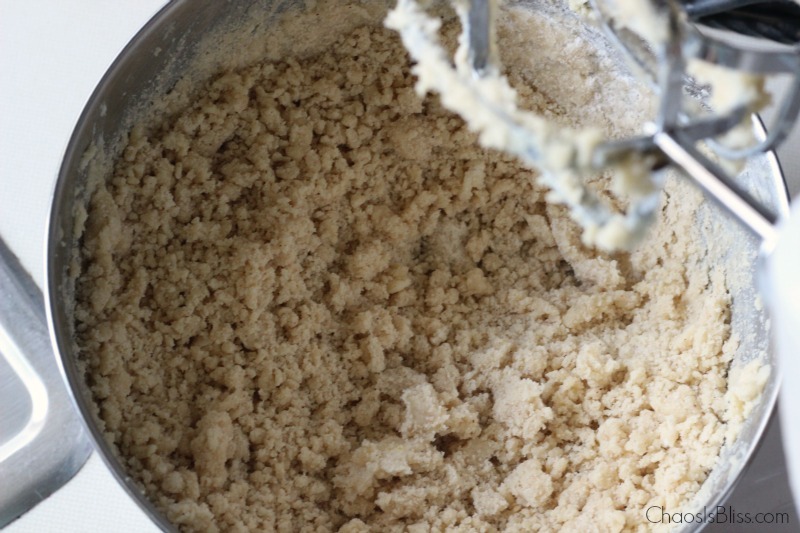 Dough will look crumbly. Grease or lay parchment paper onto a cookie sheet. Divide and shape dough into long rolls around 1″ thick. Cut into 2″ to 2 1/2″ sections and separate by an inch or so (they don’t spread much at all). Bake at 350° for 12-14 minutes. While the cookies are baking, it may be a good time to wash your mixer beaters unless you have an extra set, to use for the frosting. Cool on wire rack before frosting. 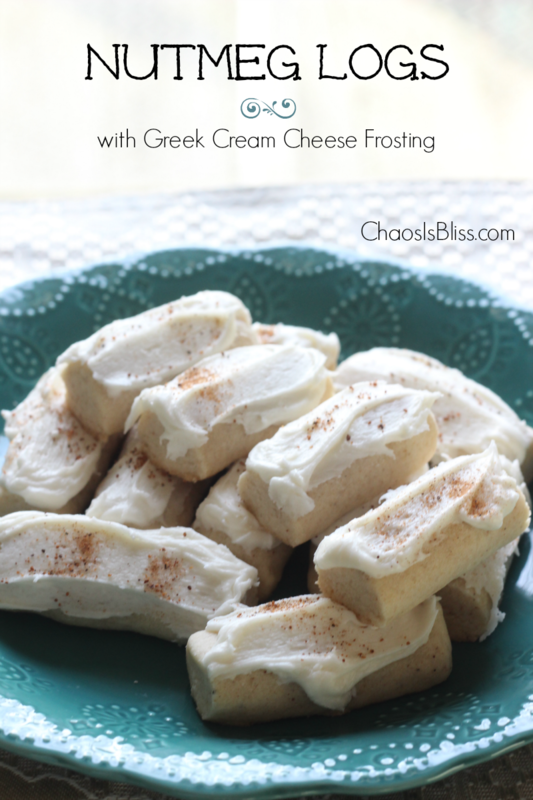 To make frosting, cream together the Greek yogurt cream cheese with butter until well blended. Add in flavorings; mix well. Slowly add in powdered sugar, stopping to scrape sides a few times. Mix in half & half until well combined. Spread a light layer onto cookies and before the icing hardens, sprinkle lightly with nutmeg. 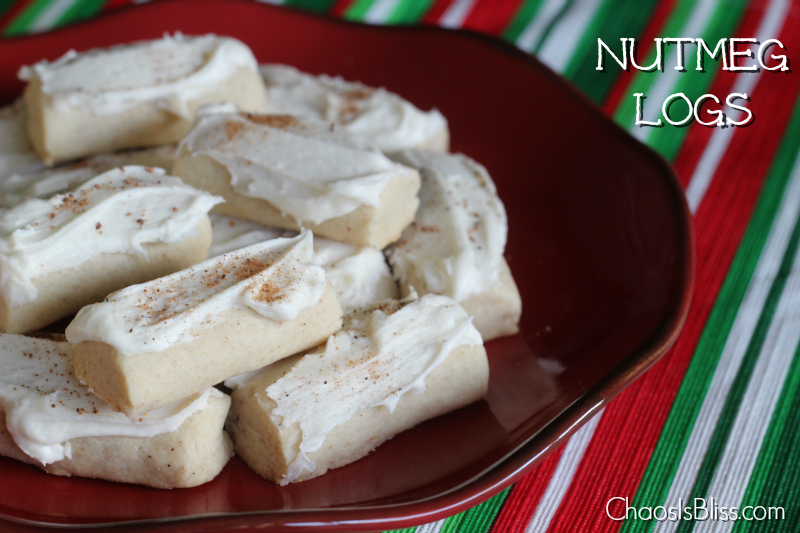 I hope you enjoy these light, buttery Nutmeg Log cookies as much as I do! 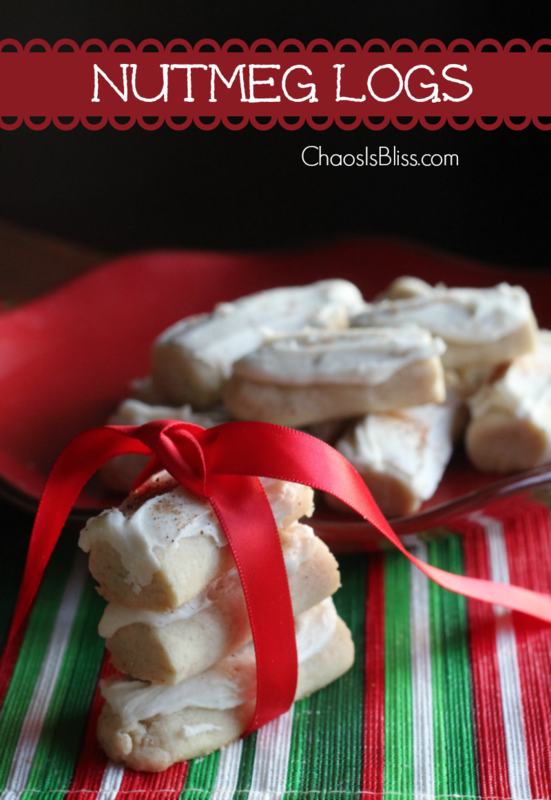 If you’re on Pinterest, be sure to pin this recipe to your desserts or Christmas boards! This post was originally published November 25, 2015. 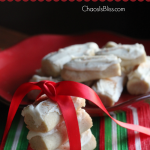 Brown Sugar Shortbread – another great Christmas cookie exchange recipe! In a mixer, cream butter with vanilla and almond flavorings. Gradually beat in sugar, then blend in egg. In a separate bowl, mix together flour, nutmeg and salt. Add to butter mixture and blend well. Grease or lay parchment paper onto a cookie sheet. Divide and shape dough into long rolls around 1" thick. Cut into 2" to 2 1/2" sections and separate by an inch or so (they don't spread much at all). Bake at 350° for 12-14 minutes. Cool on wire rack before frosting. 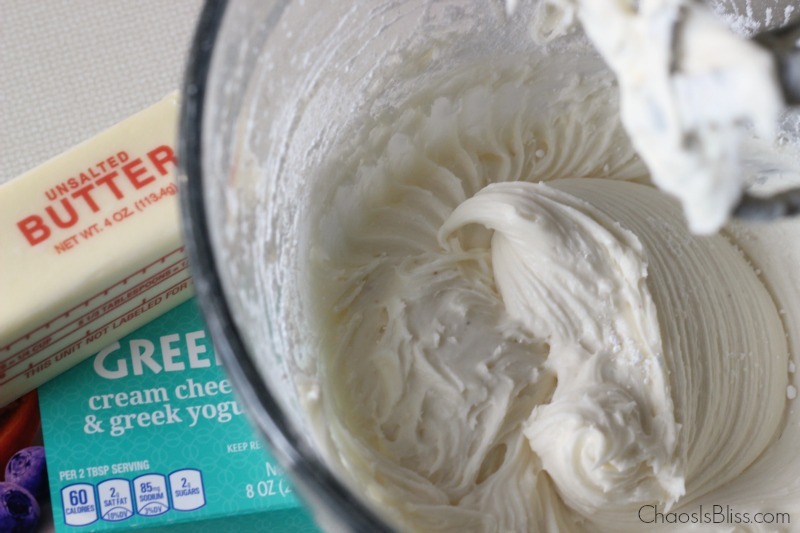 Cream together the Greek yogurt cream cheese with butter until well blended. Add in flavorings; mix well. Slowly add in powdered sugar, stopping to scrape sides a few times. Mix in half & half until well combined. This post was sponsored by Indiana’s Family of Farmers, but all words are 100% my own. See my disclosure policy for more info. Yum! I’m adding these to my Christmas baking list! Pinned. Good Morning Ann Marie, this look fantastic. I have a list of cookies that we bake every year and I’m adding this recipe to that list. Always looking for a good cookie. 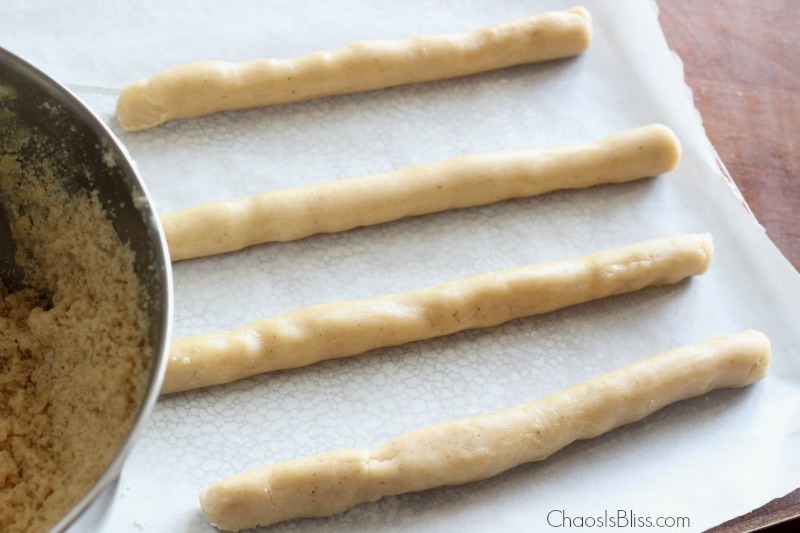 I’m pinning for this weekend’s baking bonanza. Hi Lynn! Hope you get a chance to try the recipe! What a fun and yummy looking recipe! Thank you for linking up with us at The Wednesday Round Up and we hope to see you back next week! Thanks for the linky Emily! 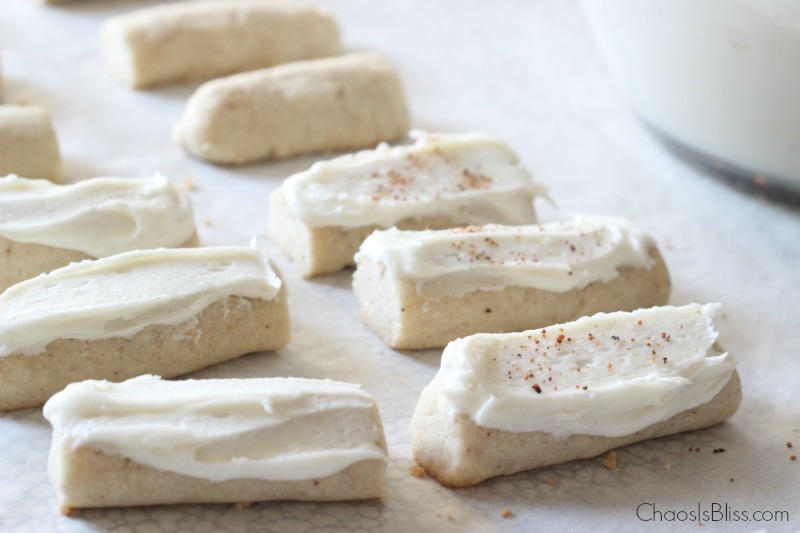 These cookies have some of my favorite ingredients: butter, cream cheese, and nutmeg. Pinning! Thank you! Hope you get the chance to try them!